While I was looking through my photos of Wall Brown butterflies from Kefalonia for my previous post The megera I noticed that one of them looked slightly different. As you can see this one is distinctly darker and less heavily marked and so at first I thought it might be an aberration. But then it occurred to me that it might actually be another species. 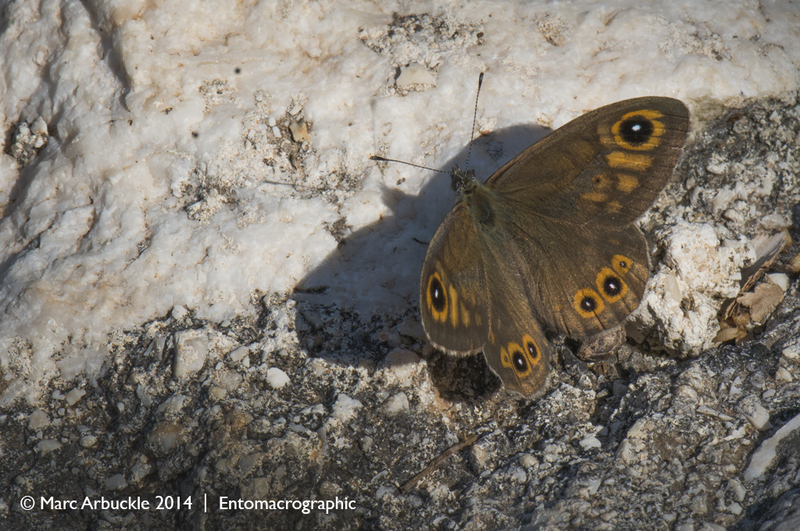 I was right, it’s the Large Wall Brown Lasiommata maera a male in this instance and a new species for me. I must admit I hadn’t really noticed when I took the photo. But even if I had, minus my reference books and with no internet it would have been difficult to get confirmation. But this is a species that has been seen in Britain, in Shrewsbury, Shropshire but not since 1931 and even then it is suspected these were an accidental introduction. In Greek mythology Maera was the hound of Erigone, daughter of Icarus, who after death was turned into the dog star, Procyon which is the brightest star in the constellation Canis Minor.